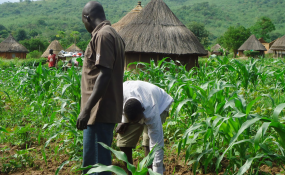 Abuja — To address numerous challenges bedeviling small scale farming in the country, the Federal Government may adopt phygital technology to reach farmers across the country. The Permanent Secretary, Ministry of Agriculture and Rural Development Bukar Hassan, while speaking during the presentation of the phygital smallholder value chains technology in Abuja harped on the need to provide extension services for small scale farmers. He said: "If we want the small scale farmers find its right foot place in Agriculture, we must do exactly what we are saying here; we must provide the Farmer extension services, the knowledge he will need to evolve his farming skills from subsistence to commercial farming, and I believe this technology would help us solve so many problems". The Director General, Manobi Daniel Annerose said the project to be implemented in collaboration with the International Crop Research Institute for the Semi Arid Tropic (ICRISAT), said the aim of the project is to reach 100,000 farmers before the end of 2018, and reach 50million farmers across Africa by 2020. The the project would monitor the production process to harvesting, transportation till it get to the final consumer. The Director, Research and Development Digital Agriculture Manobi, Pierre Sibery Traore, explained that the initiative is divided into two phases of agcelerant and phygital technology. He added that the agcelerant is the value chain orchestration platform that helps link smallholders farmers to financial services, insurance, offtakers that is agro industries, agro advisors and giving them technical support on how to meet their production target. He said the essence of the project is to ensure the safe inclusion of the small scale farmers to the World Food Market stressing that because of the size of Nigeria economy the country would be a major supplier of food to the world in the coming decade and there is the need to set in motion the phygital infrastructure to make it happen. Traore further explained that the organization is also launch the Nurturing Africa Digital revolution for Agriculture (NADIRA), explaining that the purpose was to embed in phygital agriculture the use of advance satellite technology. He said they are working with the European Space Agency who have develop a system that has some satellite updating the earth and providing free data for up to 10meters for every five days all over the world. He said the data would help monitor crop response in smallholder field in aerial time and embed the data stream into mobile telephoning and otherphygital infrastructure.